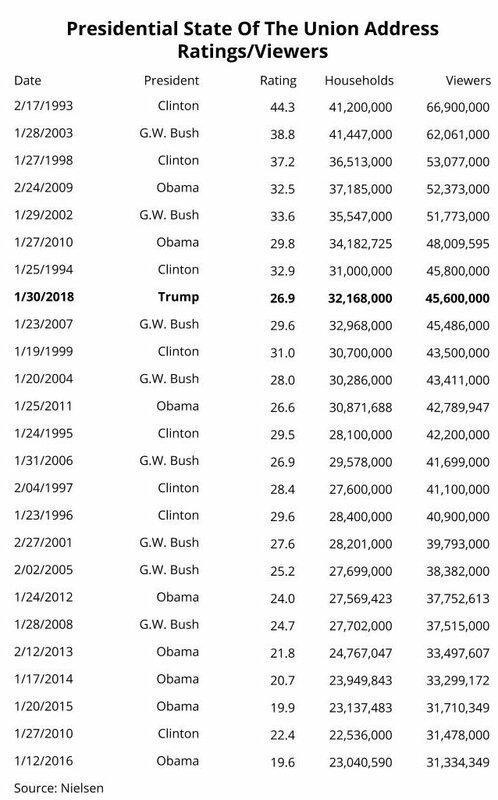 Media Post’s Joe Mandese reports that President Trump’s Nielson ratings are below previous presidents. Donald Trump has been called the “ratings” President, because of his propensity to use the TV industry term to refer to his Presidential performance, and because he’s an ex-reality TV personality and producer. But based on Nielsen’s official ratings, the performance of his first State of the Union Address wasn’t exactly huge. While it’s true that the ratings of Presidential State of the Union addresses have been trending downward in recent years, Trump’s first SOTU ranks only eighth in terms of viewers among the last 25 to be aired on the major broadcast and cable networks carrying it live, according to an analysis of Nielsen data. 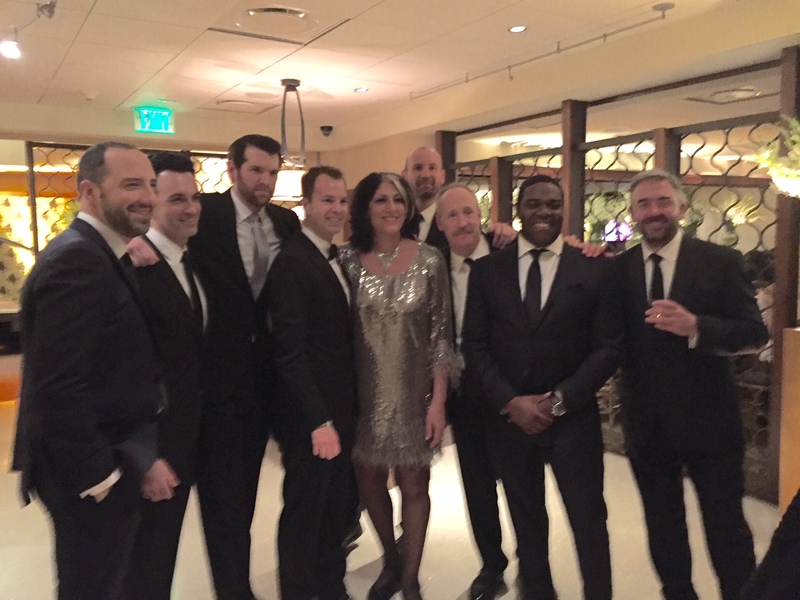 The Veeples took the stage at the 24th annual Screen Actors Guild Awards, which were held Sunday evening, January 21st, as HBO’s VEEP took home the night’s biggest trophy for comedy for its sixth season, and the show’s star Julia Louis-Dreyfus won the award for best actress in a comedy. Haddad Media CEO Tammy Haddad serves as a consultant on the show. “I was hand chosen because I play a spokesperson — I’m very well-spoken on the show and in real life,” said Matt Walsh, who plays press spokesperson Mike McLintock, on the show. VEEP has a long list of awards, winning outstanding comedy at the Emmys for three consecutive years, while Louis-Dreyfus has won best comedy actress at the Emmys six years running! While HBO has not announced the premiere date, VEEP’s seventh and final season is sure to be can’t-miss TV. From the moment its first excerpts leaked to the press, Michael Wolff’s Fire and Fury: Inside the Trump White House was destined to be a bestseller. 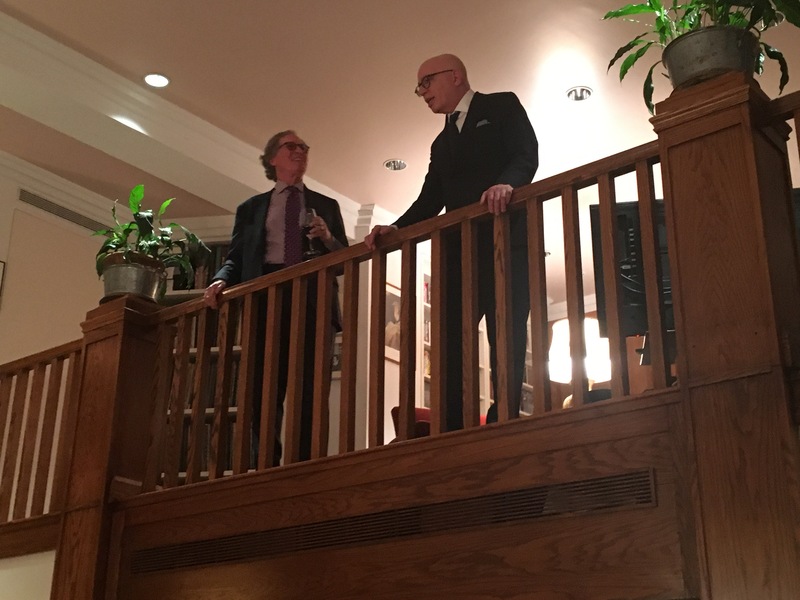 To top it off, on the same day that it was revealed the book will be turned into a TV series, The New York Times’ Shawn McCreesh writes in an article on Thursday, January 18th that Michael Wolff held a party in celebration of the book’s success at the Upper West Side home of publisher Stephen Rubin. 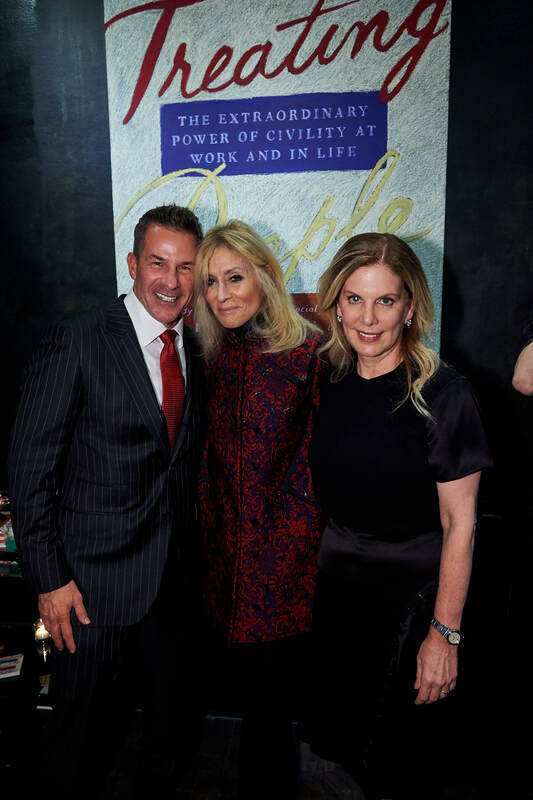 According to McCreesh, conservative firebrand Ann Coulter was in attendance, as was NPR’s David Folkenflik, CNN’s Dylan Byers, former Hollywood Reporter editor Janice Min, and Jane Friedman, the former CEO of HarperCollins. Read the full report from the party here. Purchase Fire and Fury here. The business community has been eagerly anticipating Amazon’s announcement of the location of its new headquarters, or HQ2, something the company’s founder and CEO Jeff Bezos, who recently became the richest man in the world, has been teasing over the past year. On Thursday, January 18th Amazon released its list of 20 city finalists. Cities and municipalities around the country have been vying to become home to Amazon’s white-collar workforce, offering tax incentives and prime real estate deals. Toronto, Columbus, Indianapolis, Chicago, Denver, Nashville, Los Angeles, Dallas, Austin, Boston, New York City, Newark, Pittsburgh, Philadelphia, Montgomery County, Washington D.C., Raleigh, Northern Virginia, Atlanta, and Miami. Read more details about Amazon’s HQ2 here. Filed Under: Uncategorized Tagged With: Amazon, Atlanta, Austin, Boston, Chicago, Columbus Ohio, Dallas, Denver, Indianapolis, Jeff Bezos, Los Angeles, Miami, Montgomery County, Nashville, New York City, Newark N.J., Northern Virginia, Pittsburgh Philadelphia, Raleigh, Toronto, Washington D.C.
Libby Leist, the senior producer for NBC’s The TODAY Show, will be moving into her new role as executive producer for the show’s 7am and 8am hours according to a statement by NBC Chairman Andy Lack on Wednesday, January 17th. Libby will be replacing 23-year TODAY veteran Don Nash, a longtime producer for Matt Lauer, who has produced The TODAY Show since 2012. Nash will be retiring to spend more time with his family. The move follows NBC’s decision to make Hoda Kotb a permanent anchor on the show alongside Savannah Guthrie this January, making this the first time The TODAY Show has an all-female duo. The TODAY show couldn’t be in a stronger position. Savannah and Hoda have seamlessly taken their seats and we’re off to a fantastic start in 2018. This is a tribute to them and the whole team at TODAY. With this change in anchors, and having rethought some of his priorities, Don Nash has decided to step away from his Executive Producer role at TODAY. I cannot thank Don enough for everything he contributed in nearly 30 years at TODAY – almost half of the show’s 66-year history. He led the TODAY team through many transitions and got the show back to number one. He leaves with every aspect of the show on top and with a legacy he should be proud of. As you all know so well, among many other skills Don is one of the best live control room producers in the business. We’ve offered him a number of roles within NBC News and NBCUniversal, and we hope he’ll stay in the family. Don leaves a big hole at TODAY, but we are so fortunate to have extraordinary producers who can step up. We are pleased to announce that Libby Leist is being promoted to EP of TODAY’s 7am and 8am hours. Libby brings tremendous talent and experience to this role, having served as senior producer of the 7am hour for the last 5 years. She has led the show’s political coverage and special events, including candidate town halls and TODAY’s historic broadcast from inside the White House. Libby has spent her career at NBC News, starting as a desk assistant in DC in 2001, and later rising to become Andrea Mitchell’s State Department producer – a role for which she traveled the world – and then several senior producer roles in the bureau, including MSNBC’s The Daily Rundown and Capitol Hill producer. Libby will report to Noah, and will work closely with Tom Mazzarelli who will continue in his pivotal role for the show; as well as with Jackie Levin, EP of the 9am, Tammy Filler, EP of the 10am and Matt Carluccio, EP of weekends. Please join me in wishing Don every success in his next endeavor and congratulating Libby on her promotion. 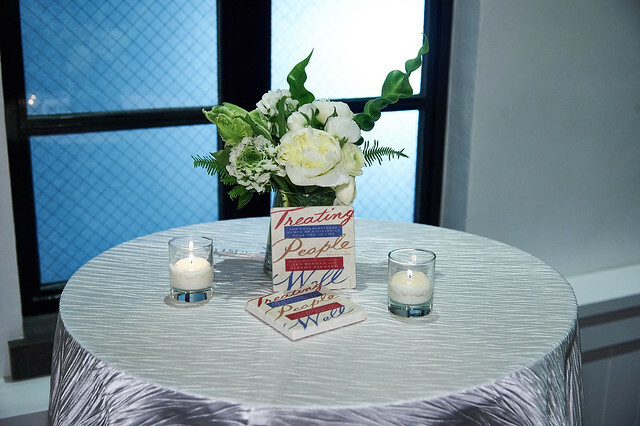 WHC Insider’s Tammy Haddad spoke with two Former White House Social Secretaries about their new book on civility and social skills, Treating People Well: The Extraordinary Power of Civility at Work and in Life. 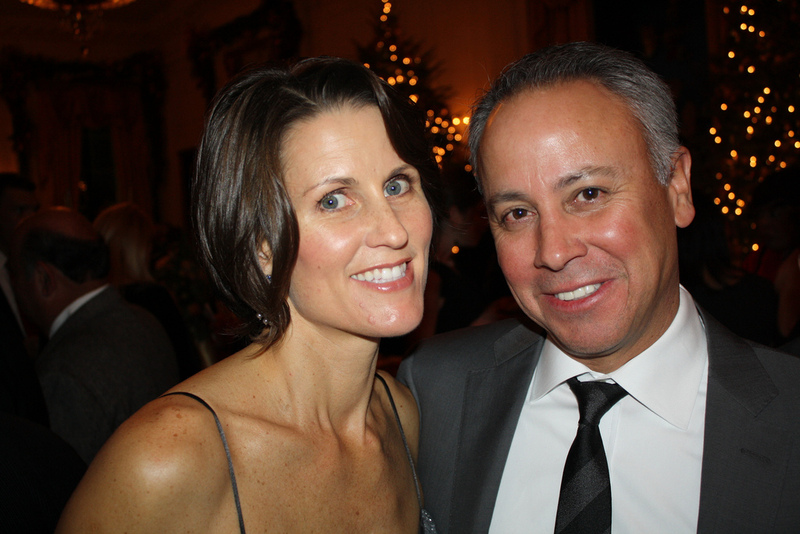 Lea Berman, who worked for George and Laura Bush, and Jeremy Bernard, who worked for Michelle and Barack Obama, are the ultimate White House Insiders. Join us as we talk about how to deal with awkward situations, how to not take things personally (or too seriously), and how not to behave while a guest at 1600 Pennsylvania Avenue. 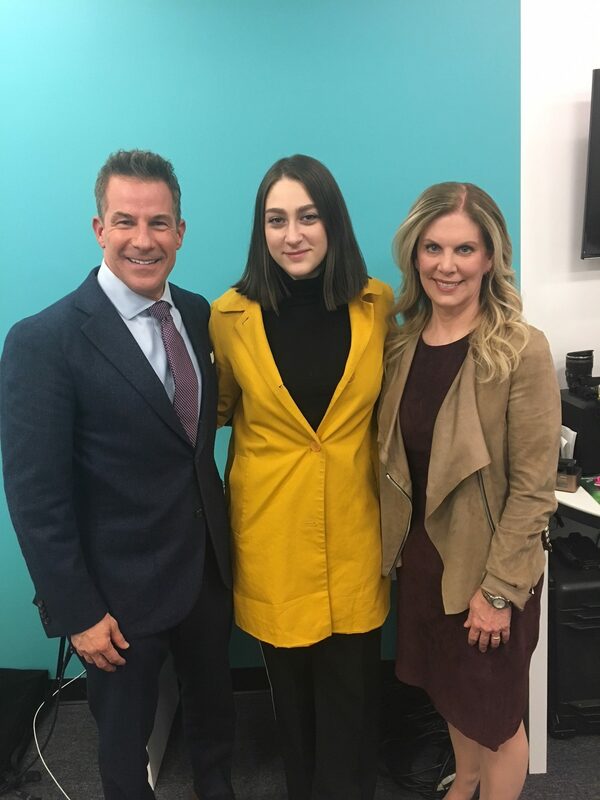 Volta Insider host Rachel Greenberg met with Jeremy Bernard and Lea Berman, both former White House Social Secretaries, about their new book Treating People Well: The Extraordinary Power of Civility at Work and in Life, which takes a look at the ins-and-outs of professional and personal etiquette. Greenberg got the scoop on working at the White House with presidents and First Ladies, got advice on etiquette, and learned what it means to “radiate calm”. You can listen to the latest episode of Volta Insider here. Order The Extraordinary Power of Civility at Work and in Life here. Jeremy Bernard and Lea Berman, two former White House Social Secretaries, celebrated the publication of their new how-to book on civility and etiquette, Treating People Well: The Extraordinary Power of Civility at Work and in Life, at a party hosted by Connie Milstein at Greenwich Village’s Little Owl townhouse on Wednesday, January 10th. Jeremy Bernard served as President Obama’s Social Secretary from 2011–2015, and Lea Berman served as Social Secretary for the George W. Bush White House from 2004–2007. Legendary gay activist David Mixner toasted the authors, noting the importance of civility and inclusion. Helping them celebrate were notables from Washington, New York, and LA including Wayne Berman, Alice Berman, Deesha Dyer, Robert Colacello, Thomas Roberts, Jonathan Capehart and Nick Schmit, Robert Zimmerman, David Adler, Ryan Williams, Tammy Haddad, Nan Graham, Kate Lloyd, Hudson Young, Hildy Kuryk. You can purchase the book on Amazon here. 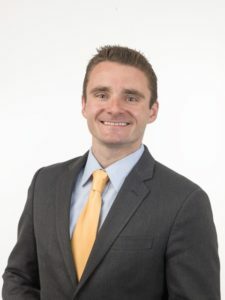 Former George W. Bush White House press representative Dan Meyers has joined public affairs consulting firm APCO Worldwide as senior director and head of advocacy. In addition to his White House credentials, he was special assistant to the political director of the Republican National Committee, and a worked as an aide for Rudy Giuliani during his 2008 presidential bid. Prior to joining APCO, Meyers spent nearly a decade with public affairs firm DCI Group, leaving the organization as Vice President. MSNBC veteran producers Tina Urbanski and Colleen King have been promoted to showrunners for Hardball and The 11th Hour respectively. Urbanski takes on the role of co-executive producer at Hardball with Chris Matthews, one of the cable channel’s longest-running shows. She takes the reins from Ann Klenk, a veteran producer who spent 19 years at the network and will be retiring from television. King, a longtime Hardball producer, moves up from senior producer of The 11th Hour. Colleen began her career at CBS and had been a longtime Hardball producer. I am thrilled to announce the promotions of two of our best, Colleen King and Tina Urbanski, to executive producer. Colleen now helms The 11th Hour as executive producer. A key member of the 11th Hour family since the program’s inception, she helped grow the broadcast with Pat Burkey from a 30-minute “pop-up” to the #1 cable news program at 11 o’clock. As a senior producer, Colleen worked across the network on many of our shows and specials, including Hardball, Morning Joe, The 11th Hour and our 2016 election coverage. With Colleen managing The 11th Hour, Pat will be focusing on Deadline: White House, and will continue working with Brian Williams on breaking news coverage. Tina takes on the role of co-executive producer at Hardball, continuing her fantastic work alongside fellow co-EP Court Harson. She first joined us here at MSNBC in 2002 as an assistant to Chris Matthews, quickly rising through the ranks. While at Hardball, Tina produced memorable interviews with U.S. presidents, politicians and top newsmakers both in-studio and at remote locations around the world, helping the program to become a staple in our primetime lineup. 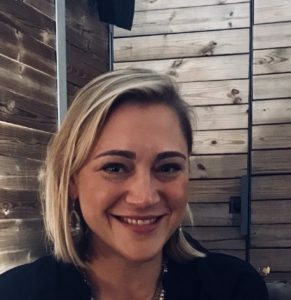 She was also an important member our 2016 presidential election team, bringing our coverage to life as a senior producer on the campaign trail, from debates to party conventions. Tina and Court take the reins at Hardball as current co-executive producer Ann Klenk retires after 19 years with NBC family. Ann is a core member of the MSNBC team, and her spirit and dedication are unparalleled. We wish her the best in all her future endeavors. Please join me in congratulating both Colleen and Tina on their new roles.